Do please note that Freemap is now a very old project dating from 2004 and sees relatively little work these days. It does have limitations and probably needs a refresh, but I have precious little time to do much work on it with a range of other projects on the go, primarily Hikar and a resurrected OpenTrailView. However, I've kept it up as it still has use, and its source code is available on GitLab should you wish to work on it. Freemap is a project to create free and annotatable maps of the UK countryside, using OpenStreetMap data to create the maps. Freemap maps aim to show not only the official rights of way, but all paths with public access, many of which are missing on other maps. 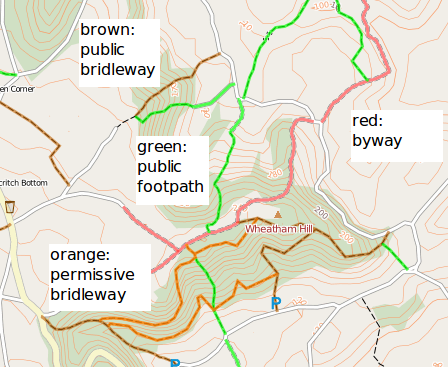 Using Freemap's interactive features - how to annotate the map and create walking routes. The map isn't showing! Why? Other software hosted on this server and available for download. Note how some paths and tracks have no coloured overlay. 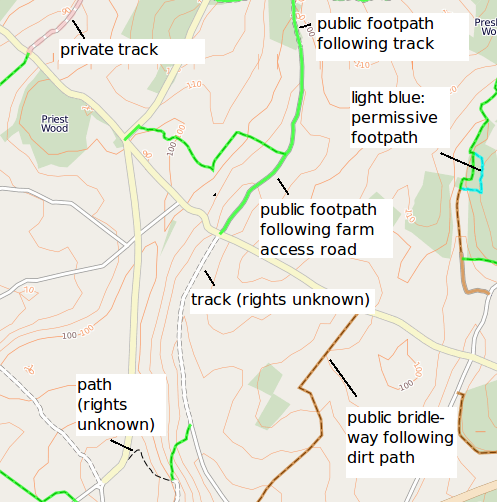 These are paths and tracks for which walkers' rights are unknown, i.e. it is not known whether they are walkable or private. Also note the public footpath in the top centre of the map, and how its southern end follows a farm access road and its northern end follows a track. Draw your own walk route and automatically get a description of it, ready to take on a walk. Currently walk routes are available as GPX. How to do all this is described below. Note that any data added (be it notes or walking routes) will have to be authorised by myself before it goes live. You can share notes by adding them to the map, for example, problems (mud, barbed wire fence, mad cows etc....) or provide directions where the course of the footpath might be unclear. When logged in, select the "marker" icon from the toolbar, click on the map at the position where you want to add the annotation. Add your text and click OK. When the map is loaded, you'll see existing notes as markers (exclamation marks on a red or brown background). You can simply click on one to see the note. You can then add descriptions to the walk route. Select the marker icon from the toolbar option and drag the marker to your walk route at the appropriate place. You will be asked to enter a description. Make sure the "Add to walk route" checkbox is selected. The walking route will be downloadable from the site. When logged in, you can select "My routes" to see all your routes, and the start of walking routes are shown on the map as foot icons. Routes are currently available for download in GPX format, so they can be imported into a GPS device. Freemap has an accompanying Android app, OpenTrail. With OpenTrail you can add and share notes "in the field" on your device: these will be uploaded to the database. Furthermore, you can record a walking route while out walking, add notes to it, upload to Freemap and share with others. Wider range of information included on the map: in particular stiles, gates, field boundaries (where in OpenStreetMap), viewpoints, cafes, restaurants and power lines. Search results now show the county or district of places found, where this has been added to OSM. If the map doesn't show immediately, it's because the map for that area needs to be rendered (drawn). Generating the map data from the database takes time as this is a relatively low-spec server. It may take some time in built-up areas. However, once an area of map is drawn, it is cached which means that next time you visit that area, the map will be drawn much more quickly - a second or two. Also please note that from early 2012, maps have been drawn in the browser using HTML5 technology and the kothic-js renderer. The decision to switch to in-browser rendering has been made as a result of the large demands of server-side rendering due to the increased size of the OpenStreetMap database. The move to in-browser rendering also means that you will need a moderately up-to-date browser (something released in the last 5 years or so); in particular, Internet Explorer versions before IE9 will not work. There are some limitations with Freemap as it stands: in particular, due to server constraints it's restricted to England and Wales (Scotland and Northern Ireland - and indeed the Republic of Ireland - also available but without contours), and it cannot currently handle certain types of OpenStreetMap data. The main example of this is "multipolygon relations", which is the mechanism OSM uses to handle situations such as lakes with islands or forests with "holes" of open land within them. The principle effect is that, unfortunately, many of the larger lakes in the Lake District are not drawn. Also, artefacts sometimes occur at tile boundaries due to an as-yet-unknown incompatibility between the underlying Kothic library and my data. Freemap basically started up in 2004 more or less at the same time as OSM itself, but originally used its own database. My original motivation was that I wanted to illustrate some long-distance walks I did across England and Wales around the turn of the millennium, but found that I could not do that with OS maps without paying expensive licencing fees. So I thought it might be a good idea to create my own maps based on GPS data. Then in early 2005 I met Steve and, once a tagging scheme had been sorted out, contributed my data to OSM; Freemap then used OSM data for its maps, the maps still being rendered on the Freemap server, originally using PHP/GD and later using Mapnik. Eventually the larger size of the OSM database meant that server-side rendering used up too much resources, so a decision was made in early 2012 to switch to browser-based rendering using Kothic-JS. This means maps are a little slower to draw, but with the increasing power of desktops and laptops in recent years this is less of a problem. Here is a description of how Freemap is maintained, should you be interested. A standard OSM PostGIS database is present on Freemap, containing selected OSM data. County extracts are downloaded from geofabrik.de, and then Osmosis is used to extract the relevant information and osm2pgsql to import to the database. Using county extracts means that the memory issues of trying to import the whole of the UK into the database at once can be avoided, so thanks to Frederik for that! A web service has been written which provides tiled OSM data as GeoJSON (or a slightly modified version of GeoJSON, see kothic-js). On the client side, kothic-js parses the GeoJSON and renders it to produce a visible map, using the MapCSS file here.